Would you deem yourself able to understand – even partially – the general meaning of a text written in a language you know nothing about (except maybe its existence) such as Basque, Estonian, Hungarian or Turkish? Of course you can! This was the intention of Labos de Babel Monde's playful demonstration “The Magic of Language Equality: 12 at Once!” All you need is that same text available in another language you do not speak (but one a little bit less unfamiliar to you than the first) and to gang up! 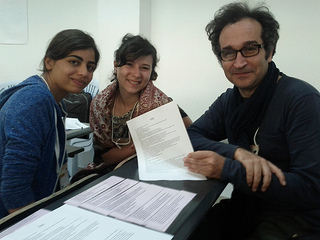 A studious and merry atmosphere was present in a quiet room of the El-Manar University Campus during the 2013 World Social Forum in Tunis. It was a temporary oasis away from political or social discussions, but none the less at the core of the dignity issue (the motto of this year's WSF). The organizers handed out bunches of plastic-coated paper strips, printed with seemingly incomprehensible pieces of text, and multicoloured felt-pens to teams of two. They explained the rules of the game: first, sort out by language, second, arrange in text order, via any clues… it's a detective's job! That done, the focused players – to be sure, it was fun – joined together around a common mysterious language, now laid out on regular sheets of paper. With the help of the same text (which proved to be an excerpt of the Little Prince encountering the fox) in a slightly less unfamiliar language (German, Catalan, Portuguese, etc) they tried to identify the words of the same meaning, guess snippets, and rebuild the story. 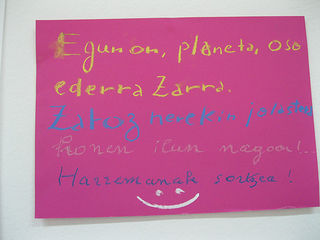 And, finally, they wrote a short poem in this newly discovered language… It was undoubtedly magic! Indeed, all languages explored in this workshop were written in Latin letters, but the experiment also exists with Arabic-based text. Using the principle of the Rosetta stone, which provided the key to the modern understanding of Egyptian hieroglyphs by presenting the same text in three scripts, Labos de Babel Monde has also held a workshop with this “Little Prince” excerpt translated into Moroccan and Tunisian colloquial Arabic (or Darija) plus 2 varieties of written Arabic. Moreover, the group is now working on a similar experiment with ten languages of India, using the text of the Declaration of Human Rights for the exercise. While the group plans to make their tools more available both on- and off-line, their practice aims at children of mixed ages and teachers, through training courses, festivals, and forums. You can find more information by visiting their website (in French), and in the book by Joelle Cordesse, a founder of the group, “Apprendre et enseigner l'intelligence des langues” (Learning and Teaching the Intelligence of Languages). And if their approach appeals to you, you can also contact them through the website, and give them a hand… To be able to expand, they need their statement translated into many languages!